This was a beautiful puzzle, but I did not receive as many answers as I would have liked. Correct answers came from Pratik Poddar and Suman Saraf. My younger daughter, Arushi (9), solved it with some help. I took the liberty of coloring the same grid in a chess like pattern. 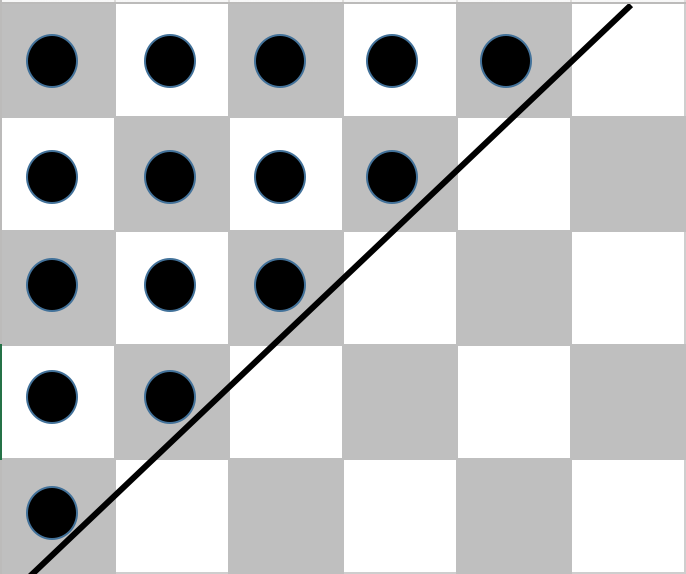 Notice that in any move, a penny on the black square can only move to another square with black color, and vice versa, one on white can only move to a white one. Also notice that even if a diagonal move was allowed, this principle remains true. Above the line, we have pennies on 9 black squares and 6 white squares. On the other side, there are 6 black and 9 white squares. Therefore 9 pennies from black squares above the line cannot find enough black squares below the line. The above is true even if we remove one penny from a black square or even 2 pennies from a black square. This entry was posted in Solution and tagged Alok Goyal, Chess Puzzles, logic puzzles. Bookmark the permalink.